Sand dunes in a vast area of northern Mars long thought to be frozen in time are changing with both sudden and gradual motions, as revealed by images from a high-resolution camera aboard NASA's Mars Reconnaissance Orbiter, or MRO. These dune fields cover an area the size of Texas in a band around the planet at the edge of Mars' north polar cap. 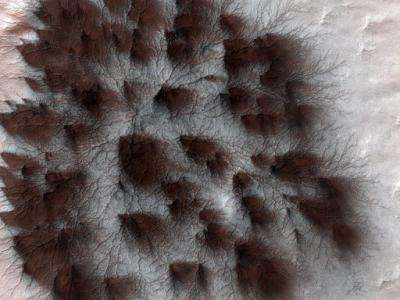 Although the new findings suggest they are among the most active landscapes on Mars, few changes in these dark-toned dunes had been detected before a campaign of repeated imaging by the High Resolution Imaging Science Experiment (HiRISE) camera on NASA's Mars Reconnaissance Orbiter, which reached Mars five years ago next month. The HiRISE camera is operated by the University of Arizona's Lunar and Planetary Laboratory. Scientists had considered the dunes to be fairly static, shaped long ago when winds on the planet's surface were much stronger than seen today, said HiRISE Deputy Principal Investigator Candice Hansen of the Planetary Science Institute, Tucson, Ariz. Several sets of before-and-after images from HiRISE over a period covering two Martian years -- four Earth years -- tell a different story. "The numbers and magnitude of the changes have been really surprising," said Hansen. A report by Hansen and co-authors in this week's edition of the journal Science identifies the seasonal coming and going of carbon-dioxide ice as one agent of change, and stronger-than-expected gusts of wind as another. A seasonal layer of frozen carbon dioxide, or dry ice, blankets the region in winter and changes directly back to gaseous form in the spring. "This gas flow destabilizes the sand on Mars' sand dunes, causing sand avalanches and creating new alcoves, gullies and sand aprons on Martian dunes," she said. "The level of erosion in just one Mars year was really astonishing. In some places hundreds of cubic yards of sand have avalanched down the face of the dunes." Wind drives other changes. Especially surprising was the discovery that scars of past sand avalanches could be partially erased in just one Mars year. Models of Mars' atmosphere do not predict wind speeds adequate to lift sand grains, and data from Mars landers such as Phoenix show high winds are a rare occurrence. "Perhaps polar weather is more conducive to high wind speeds," Hansen said. In all, modifications were seen in about 40 percent of these far-northern monitoring locations over the two-Mars-year period of the study. Related research with HiRISE previously identified gully-cutting activity in smaller fields of sand dunes covered by seasonal carbon-dioxide ice in Mars' southern hemisphere. A report four months ago showed that those changes coincided with the time of year when ice builds up. "The role of the carbon-dioxide ice is getting clearer," said Serina Diniega of NASA's Jet Propulsion Laboratory, Pasadena, Calif., lead author of the earlier report and a co-author of the new report. "In the south, we saw before-and-after changes and connected the timing with the carbon-dioxide ice. In the north, we're seeing more of the process of the seasonal changes and adding more evidence linking gully activity with the carbon dioxide." 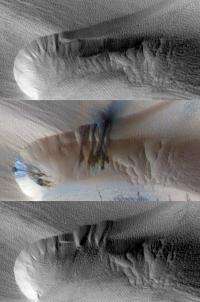 An image recieved from NASA in 2009 shows Mars' seasonal cap of carbon dioxide ice as it sublimates (goes directly from ice to vapor) in the Martian spring. Mysterious dark sand dunes around Mars' northern polar cap are shifting with the seasons, as carbon dioxide gas changes form and sparks landscape-altering avalanches, said a study published Thursday. Researchers are using HiRISE to repeatedly photograph dunes at all latitudes, in an effort to understand winds in the current climate on Mars," Hansen said. "It's becoming clear that there are very active processes on Mars associated with the seasonal polar caps." The new findings help scientists to better understand what features and landscapes on Mars can be explained by current processes and which require environmental conditions no longer present on the planet. "Understanding how Mars is changing today is a key first step to understanding basic planetary processes and how Mars changes over time," said HiRISE Principal Investigator Alfred McEwen, a professor in the UA's department of planetary sciences and a co-author of both reports. "There's lots of current activity in areas covered by seasonal carbon-dioxide frost, a process we don't see on Earth. It's important to understand the current effects of this unfamiliar process so we don't falsely associate them with different conditions in the past." Yes, climates change continuously for the planets that orbit a variable star. That was well known before the Climategate scandal. Continuous climate change is in the geologic record. It will remain as a concern for mankind. Hopefully it will not be used again for political purposes. 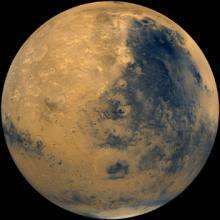 Omatumr, this article is about Mars, please keep your comments on topic. I don't want to see another thread derailed by childish namecalling. Oh, let him play! We could all do with the light relief his comedy workshop provides! At least this time he's half right with his crackpot theories. The sun is resposible for Mars climate change. The sun, and the newly exposed darker sections of the planet. Land use change doesn't necessarily need a human vector to occur. Who knows. The old period of Martian 'good climate' is billions of years old. But enough time elapsed in that period to develope life. And spread it. Suppose in some dusty cave is a hidden stainless nickel steel door at the back, impossibly old on monstrous rusty hinges that on earth would have been gone yet here it survives. Some scientist opens it to find air at the consistancy of primordial Mars. A museum...a storehouse of seeds, pine, deciduous trees, books, a special book on a stand. Translated with the aid of local references placed with it: ...and the Hand of God moved across the face of the deep, for In the Beginning God created Heaven and Mars....all seemingly written in a language similar to Vedic and to early Babylonian, precursors to Aramaic. Happens sometimes when one says......'If'.